Seven days of gratitude. | 17.12.2017. — sophie rosie. I saw this post on With Risa's blog last week, and absolutely loved the idea. 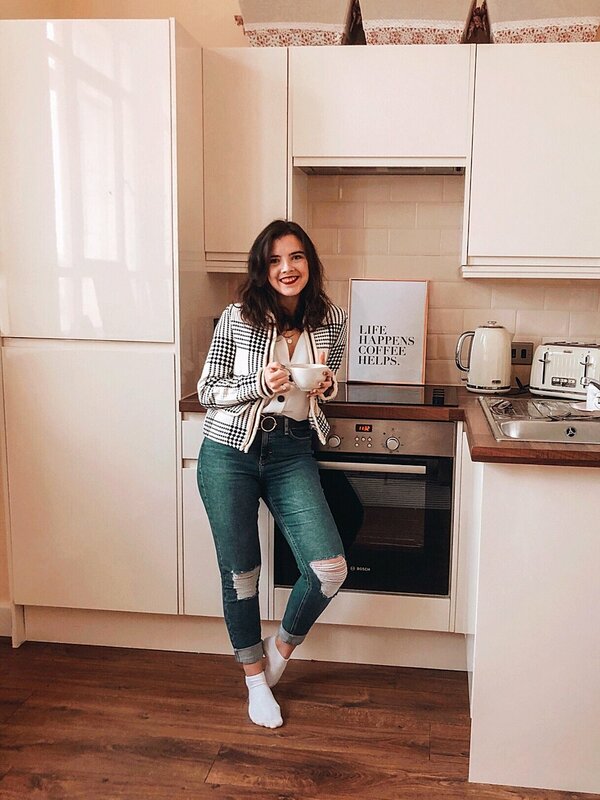 If you read my post - I'm neglecting the basics of self-care - you'll know that I'm not feeling the best at the mo, and so I thought detailing out the best things that have happened during the week, those things that made me smile and happy, would be a great way to try and lift my mood a little. This may be a day late (I got slightly distracted watching The Apprentice Final last night - whoops), but I thought I may start trying to do something like this again. Something to try and make me look for those little moments of happiness in every day. I'm hoping it may be a first step to helping me feel more like 'me' again. So, here are my seven days and moments of gratitude for last week. I had the best Monday this week. I'd booked it off as annual leave as I was meeting up with a friend from Liverpool while she was down in London for a few days. I had hoped that we would have been able to spend the day doing some lovely things around London, however the weather was grim. It rained...hard, all day. And so we resorted to a morning of shopping, and then finding a cute lunch spot in Covent Garden for the rest of the afternoon! It really was such a lovely little day. Tuesday started out a bit chaotic. The overground trains weren't running and so I had to get a bus and two tubes instead. Thankfully, a lot of people in the office were having similar travel problems, so I wasn't the only one that rocked up late! I then had 3 1/2 hours to cram in 2 days worth of work - everything from being off on Monday, and then everything for Tuesday morning and afternoon, as I was heading out of the office for the afternoon for a Christmas lunch! Well, it was titled 'Christmas lunch', but it was scheduled in my diary for the whole afternoon. Spoiler: we didn't make it back to the office that day. But I definitely wasn't complaining! Wednesday was the day of our office Christmas party, and it was fab. I've never been to a Christmas party like it - there was a bucking bronco/reindeer, a photo booth, the biggest Pick n Mix station, as well as a games room, and of course - a night of dancing! It was so nice having the chance to get dressed up, throw on some red lipstick and have a great night with my team and the office. With it having been the office Christmas party the night before, our boss very kindly gave us an extra hour in bed on Thursday morning! I turned up to the office at 10am to the smell of a fresh order of McDonalds breakfast having been ordered for everyone! I then only had 2 1/2 hours to work before it was time for me to head off for the day again - I'd taken half a day of annual leave so that I could treat myself to some festive nails before Christmas. On Thursday evening, I met up with the lovely Aisling. It's been the best thing getting to see her often now we both live in London. With us both having moved from Liverpool to London this year, it's been so nice having someone who knows ~exactly~ how you're feeling. I honestly don't know what I would have done without her. Before I knew it, it was Friday and my last day in work before Christmas! Saturday was my favourite day because it was the day I came home for Christmas. I've been looking forward to this for so, so long. I got up early to run a few errands and sort the last few bits out around the house. It was such a beautiful morning, that I got the bus into town at 8am, but then ended up walking back home with a coffee in the fresh air and it was just what I needed. And then finally, by the afternoon, I was back in Liverpool and the happiest I've been in weeks. I caught up with my old flat- mate, and then had a little walk around the docks and it was perfect. Sunday was a day spent entirely at home in Preston with my family. We had a lie-in, caught up on Strictly, I then did some blogging while the boys watched football and then I picked my beloved car up from it's temporary home at my Grandads! I can't tell you how happy I am to have my car back. I've missed driving so much and I'm literally going to use any excuse to drive anywhere for the next two weeks haha! So, there we have it. Little things that made me happy and thankful for each day last week. What do you think to this type of post? Do we like it, or nah? Let me know! Dec 19 5 blogs & bloggers you need to be following into 2018.